Suleban remembers his early years in Somalia with fondness. Everything was so simple then. He went to school and played soccer in his free time. As he got older, he started working in a meat factory to earn a little income. Sadly, those simpler times didn’t last. War came to his home country, and Suleban, like millions of others, fled seeking safety. He spent the next 18 years of his life in a refugee camp in Kenya. Waiting for resettlement was difficult, but he tried to do something positive by volunteering with a Norwegian relief agency to help children in the camp. Today, after two years at the English Learning Center, a lot has changed for Suleban. He’s advanced an entire English level and can now navigate basic tasks like grocery shopping and going to medical appointments. He says, “The ELC helps me find access to whatever I need. I love coming here and have referred friends and family to enroll at school. 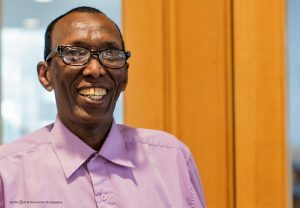 I like it because the teachers are nice, and the staff helps me a lot.” Suleban is determined to keep learning, drawing inspiration from the Somali proverb, “Without knowledge, there is no light.” The English language is that light for Suleban. Although it’s easy for Suleban to think back on the hard times, knowing that he won’t have to face those struggles again keeps him looking forward. Instead, he’s focused on the opportunities this country has for him. In the future, he sees himself working in any educational profession, as long as it involves helping others. He also dreams of returning to Somalia one day to help others who are in the same place he once was.